Behold, a piece of vintage Aqua-merch I didn't know existed! 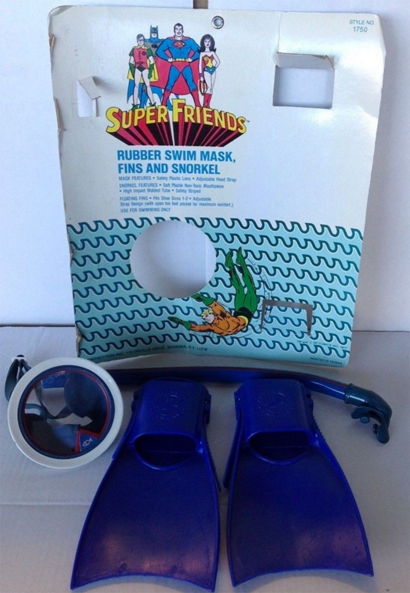 I've seen other pieces of kids' swim equipment with an Aquaman-centric Super Friends slapped on them, but this three-piece set is a new on me. Would it have killed the manufacturer to re-cast the pieces in orange or green? I guess the answer is yes. Still, I enjoy seeing Aquaman so prominent on a piece of SF merch, since he was so often unceremoniously dumped. Well, this explains why Aquaman was left off so much SF merchandise: He was swimming at the bottom of this giant card while that particular group photo was taken! Seriously, this is neat. Yeah, orange and green would have helped, but it was the 70s. Everyone was baked out of their minds.